So I’ve been looking at different binary data formats: BSON, Protocol Buffers, Smile Format, UBJSON, BJSON and others. Eventually, I decided to give BJSON a try for the following reasons. BJSON documents can be represented as JSON objects with ArrayBuffers for binary blobs. Well, time to introduce BJSON.coffee, a CoffeeScript implementation of BJSON for modern browsers. Aparts from null, booleans, numbers, arrays and dictionaries also available JSON, the BJSON specification also defines the inclusion of binary data. The specification notes that “this is not fully transcodable“, but as you might have guessed BJSON.coffee uses ArrayBuffers to represent binary data. Essentially, BJSON.serialize takes a JSON object that is allowed to contain ArrayBuffers and serializes to a single ArrayBuffer. While, BJSON.parse takes an ArrayBuffer and returns a JSON object which may contain ArrayBuffers.For those interested in using BJSON instead of a normal string encoding of JSON objects, there is both good and bad news. The bad news is that UTF-8 string encoding in modern browsers is so slow, that BJSON is slower than a conventional string encoding of JSON objects. Although, this might not be the case when/if the string encoding specification is implemented. The good news is that the BJSON encoding is 5-10% smaller than the conventional string encoding of JSON objects. The table/terminal output below from my testing script, shows some common JSON objects harvested from common web APIs. BJSON.coffee is available at github.com/jonasfj/BJSON.coffee. It should work in all modern browsers with support for typed arrays, Firefox 15+, Chrome 22+, IE 10+, Opera 12.1+, Safari 5.1+. However, I have pushed a github page which runs unit-tests in the browser and shows compatibility results from other browsers using Browserscope. So please visit it here, click “run tests” and help figure out where BJSON.coffee works. Update: Being bored today I decided to a quick jsperf benchmark of JSON.stringify and BJSON.serialize to see how much slower BJSON.serialize is. You can find the test here, which seems to suggest that BJSON.serialize might be unreasonably slow at the moment. However, it seems that slow UTF-8 encoding is responsible for much of this, and I believe it is possible to improve the current UTF-8 encoding speed. Back in high school I started TheLastRipper, an audio stream recorder for last.fm. The project started as product for a school project on copyright and issues with piracy. It spawn from the unavailability of non-DRM infested music services. Which at the time drove many teenagers to piracy. Whilst, you the morality of recording internet radio can be argued. All the research we did at the time, showed it to be perfectly legal. Nevertheless, I’m quite happy that I didn’t have to defend this assertion. Anyways, I’m glad to see that the music industry didn’t sleep for ever. These days we have digital music stores and I’m quite happy to pay for DRM-free music, and as bonus I get to support the artists as well. So it can hardly comes as surprise that I haven’t used TheLastRipper for years. Nor have I contributed to the project or attended bug reports for years. In fact it has been years since the project saw any active development. I do occasionally get an email or see a bug report from an die-hard user of TheLastRipper, and it’s in the wake of such an email I’ve decide write this post. Partly because more people will ask why it stopped working, and partly because I had a lot of fun with project and it deserves a final post here at the end. Personally, I’ve long thought the project dead, I know the Linux client have been, so I was surprised to that anybody actually noticed it when the Radio API was updated. As you may have guessed from the title of this post TheLastRipper has died from being unmaintained while last.fm have updated their APIs. Honestly, I’m quite surprised last.fm have continued to support their old unofficial API for as long as they have. So this is by no means the result of last.fm taking action against TheLastRipper. Truth be told, I’m not even sad that it’s finally dead. 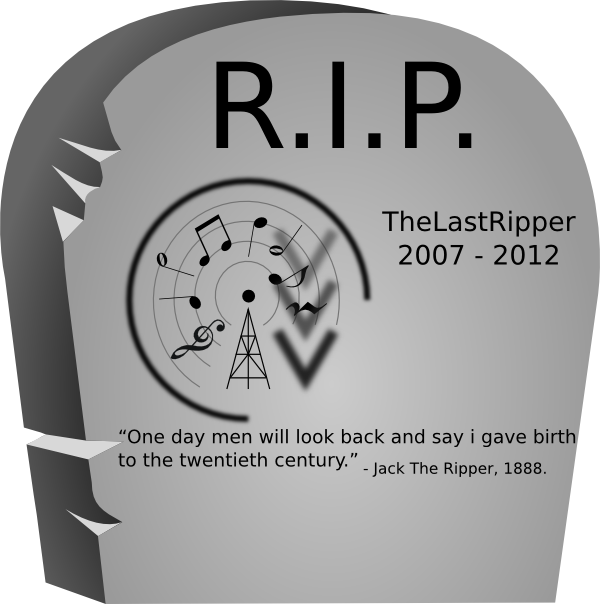 The past many years, state of TheLastRipper have been quite embarrassing. The code base is ugly, buggy and completely unmaintainable. Over the years, TheLastRipper have been downloaded more than 475.000 times, distributed with magazines (Computer Bild) and featured in countless blog posts from around the world. Which, considering that this started as a high school project is pretty good. It’s certainly been a great adventure and I’ve worked with a lot of people from around the world. So here at the of my last post on TheLastRipper, I’d like to say thanks to all the bug reporters, comment posters, testers, developers and people who hopefully also had fun participating in this project. A couple of weeks I introduced TriLite, an Sqlite extension for fast string matching. TriLite is still very much under active development and not ready for general purpose use. But over the past few weeks I’ve integrated TriLite into DXR, the source code indexing tool I’ve been working on during my internship at Mozilla. So it’s now possible to search mozilla-central using regular expressions, for an example regexp:/(?i)bug\s+#? [0-9]+/ to find references to bugs. For those interested, I did my end-of-internship presentation of DXR last Thursday, it’s currently available on air.mozilla.org (I’m third on the list, also posted below). I didn’t reharse it very much so appoligies if it’s doesn’t make any sense. What does make sense however, is that fact that dxr.allizom.org supports substring and regular expression searches, so fast that we can facilitate incremental search. Anyways, as you might have guessed from the fact that I gave an end-of-internship presentation, my internship is coming to an end. I’ll be flying home to Denmark next Saturday to finish my masters. But I’ll probably continue to actively develop TriLite and make sure this project reaches a level where it can be reused by others. I’ve already seen other suggestions for where substring search could be useful. The past two weeks I’ve been working on regular expression matching for DXR. For those who doesn’t know it, DXR is the source code cross referencing tool I’m working on during my internship at Mozilla. The idea is to make DXR faster than grep and support full featured regular expressions, such that it can eventually replace MXR. The current search feature in DXR uses the FTS (Full Text Search) extension for Sqlite, with a specialized tokenizer. However, even with this specialized tokenizer DXR can’t do efficient substring matching, nor is there any way to accelerate regular expression matching. Which essentially means DXR can’t support these features, because full table scans are too slow on a server that serves many users. So to facilitate fast string matching and allow restriction on other conditions (ie. table joins), I’ve decided to write an Sqlite extension. Introducing TriLite, an inverted trigram index for fast string matching in Sqlite. Given a text, a trigram is a substring of 3 characters, the inverted index maps from each trigram to a list of document ids containing the trigram. When evaluating a query for documents with a given substring, trigrams are extracted from the desired substring, and for each such trigram a list of document ids is fetched. Document ids present in all lists are then fetched and tested for the substring, this reduces the number of documents that needs to fetched and tested for the substring. The approach is pretty much How Google Code Search Worked. In fact, TriLite uses re2 a regular expression engine written by the guy who wrote Google Code search. TriLite is very much a work in progress, currently, it supports insertion and queries using substring and regular expression matching, updates and deletes haven’t been implemented yet. Anyways, compared to the inverted index structure used in the FTS extension, TriLite has a fairly naive implementation, that doesn’t try to provide a decent amortized complexity for insertion. This means that insertion can be rather slow, but maybe I’ll get around to try and do something about that later. Nevertheless, with the database in memory I’ve been greping over the 60.000 files in mozilla-central in about 30ms. With an index overhead of 80MiB for the 390MiB text in mozilla-central, the somewhat naive inverted index implementation employed in TriLite seems pretty good. For DXR we have a static database so insertion time is not really an issue, as the indexing is done on an offline build server. Whilst I’ve been handling most of the deployment issues, the releng team have been doing the heavy lifting when comes to automatic build, thanks! This means, that I’ve been working on cleaning up, refactoring, redesigning and rewriting parts of DXR. This sounds like a lot of behind the scenes work that nobody will ever see, however, this means that DXR now has a decent template system. And well, who would I be if I didn’t write a template for it. You can find the tip of DXR that I’m working on at dxr.allizom.org, please check out it and let me know if there’s something you don’t like and would like to appear. I realize that the site currently have a few crashes, and don’t worry I won’t rush this into production before I’ve ratted these out. Now, as evident from this blog, I’m by no means a talented designer, so if you feel that grey should be red or whatever, please leave a color code in the comments and I’ll try it out. I’m currently looking into replacing the full text search and my somewhat buggy text tokenizer with a trigram index that’ll facilitate proper substring matching and if we lucky regular expression matching. But I guess we will have to wait and see how that turns out. In the mean time leave a comment if you have questions, requests, suggestions and/or outcries. I can’t say that I have been very active on this blog the past couple of years, nevertheless when I decided to hack a little on theme this morning I found an infestation of hidden links to all sorts of crap. Apparently this sort of thing is not unheard of on wordpress blog. Anyways, I’ve been planning to slowly out phase the “jopsen” nickname, and having recently bought “jonasfj.dk” I decided to do an export of my wordpress blog. Setup a new one on a new domain. Dreamhost one click install made this rather easy, and I now have automatic wordpress updates. My old domain “jopsen.dk” will now redirect to “jonasfj.dk”, and I’ve deleted the infected wordpress install. I still have a wiki running on the old domain, but it’s no longer active, so if possible I plan to render it static, at which point I’ll move it from the domain. Update: Changed my github username from jopsen to jonasfj. Well I think that’s all the renaming I can handle for now. With respect to the “pharma hack” I think it’s sad that we live in a world where some people have so little respect for my time. After all the ad-space on my blog has no value compared to the costs of cleaning up after this. Worst of all is that these links where hidden, I only discovered them by accident, and I have no idea how long time they’ve there. Anyways, I’ve disabled ftp, used a different domain, different shell user, clean wordpress install with a Google Authenticator plugin. At least that’s a start. Whilst gedit isn’t the fastest, smartest or most fancy editor out there, I often find my self using it. With toolbars hidden and menu bar gone (unity), gedit is a neat little thing. It always works, and whilst it lacks many features compared to vim, the features gedit does offer, never pops up because I accidentally pressed some key. The one thing about gedit that I do however feel is missing, is the ability to modify shortcuts. For example switching tabs with “Ctrl + Tab” and “Ctrl + Shift + Tab”, and closing tabs with “Ctrl + F4”, feels as natural as browsing the web in Firefox. Luckily, it’s possible to install plugins for gedit, I recently found a plugin call Control Your Tabs, that allows you to switch tabs with “Ctrl + Tab”. However, it does tab switch in most recently used order, instead of switching tabs by order in tabview. I had a quick look at the source for Control Your Tabs, which turned out to be slightly complicated. While I could hack the source to fit my needs, it turned out to be faster and simpler to just write my own gedit plugin. So here it is TabControl, 50 lines of python now hosted at github. The plugin switches tabs with “Ctrl (+ Shift) + Tab” based on their order in the tabview. And on top of this it allows you to close the current tab using “Ctrl + F4”. You can find files and installation instructions in the github repository. The plugin is really short and simple, so if you want a shuffle feature for switch tabs (or whatever), this could be a good place to start. Otherwise I’d definitely recommend taking a look at the gedit plugin documentation. Anyways, it occurred to me that I haven’t blogged about my Bachelor project. So I better get it done now, as I’m off for vacation in California later tonight… This semester we worked in groups of 3, and was supposed to write a 12-20 pages article, as opposed to a 100-200 pages report. Which turned out to be quite challenging, but also somewhat nice, because we got to polish every sentence. 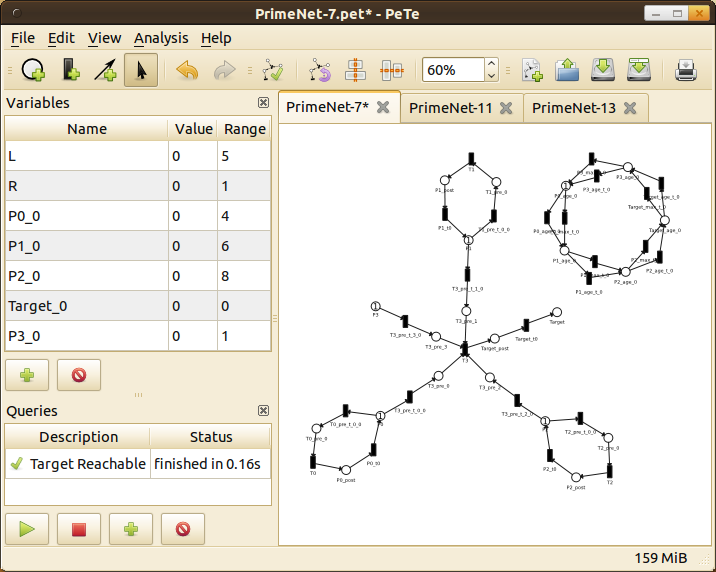 As the title of the post indicates we did a project about Petri nets, a very simple but powerful modeling language. To achieve a “feeling” of novelty we introduced global discrete variables, that you can condition on and modify in transitions, and called our new model for Petri nets With Discrete Variables (PNDV). Whilst, to my knowledge, this have not been done before, we didn’t focus on showing that PNDVs where particularly useful for any specific purpose. So that part of the project feels a little shoehorned, at least to me, and maybe only me, because we all got an A for the project. Given a PNDV or Petri net PeTe can determine if a state satisfying a given formula is possible. This problem is very hard (EXPSPACE-hard), but we had a lot of fun writing different search strategies for exploring the state space of a PNDV. Most notably we found that even quite simple heuristics can provide a huge performance improvement by guiding a search in state space. We also had great success with over-approximation, by using state equation and trap testing to disprove the satisfyability of a formula. Being slightly bored with school work I decided to take day off and work on zbar-sharp, and a few minutes ago I tagged a new release of zbar-sharp. These improvements have been underway for quite a while, and many of them have been available in the repository on github for a long time. And if you plan to use zbar-sharp I’ll recommend that you checkout the git repository once in a while. ZBar.Image: Convenience function for FourCC codes. Tests: Unit tests to test zbar-sharp and ZBar. In particular support for initializing ZBar.Image from an instance of System.Drawing.Image is very nice. Notice that System.Drawing.Bitmap is a subclass of System.Drawing.Image, so this constructor allows you to load images from files into a ZBar.Image that can be scanned. However, this feature would have been fairly unstable without a fix for the memory management issue in ZBar.Image.Data, which previously caused applications to crash at random. A thanks to the nameless commentor by the name thedarkking, who’s comment finally gave me a clue as to where the bug was. By the way, if you have any comments or questions don’t be afraid to leave a comment.You’re also welcome to use the issue reporting system at github to report bugs or feature requests.If you wish to contribute, just fork the project on github and push your code. This semester we did a project in machine intelligence, however, as I find probability calculus and Bayesian networks utterly boring I convinced my group to do a project about triangulation of Bayesian networks. A triangulation of an undirected graph G, is a set of edges called fill-ins, such that G with these fill-ins added is a chordal graph (a graph that doesn’t have a chord-less cycle of more than 3 node). Triangulation is of graphs is used for many purposes, and with difference optimality criteria, such as minimum fill-ins, minimum clique size (tree width) and minimum maximal clique sum (optimal table size), as is relevant for Bayesian networks. In this project we implemented some simple greedy triangulation heuristics, compared their result to the optimal solutions. But most interesting is probably our work on search algorithms for optimal triangulations of Bayesian networks. We based our work on two articles by Thorsten J. Ottosen and Finn V. Jensen, who does a best or depth first search in the space of all elimination orders. As far as we’re aware these articles are the only ones that proposes algorithms for optimal triangulation of Bayesian networks.